Come join us for Wild Herb Days! Wild Herb Days will include plant walks and a variety of seasonal herbal activities. Many hands at work preparing sumacade. We’ll start off the season on Sept. 18 with a weed walk and tincture making. Exactly what we’ll do depends on the plants, but likely activities include making and drinking sumacade, sampling Autum olives, making goldenrod tincture, and making burdock tincture. If we have time, we may also make a salad. In December, we’ll do herbal gift making. You’ll go home with lovely herbal gifts, including herbal vinegar, herbal shampoo and soap, and an herbal dream pillow. 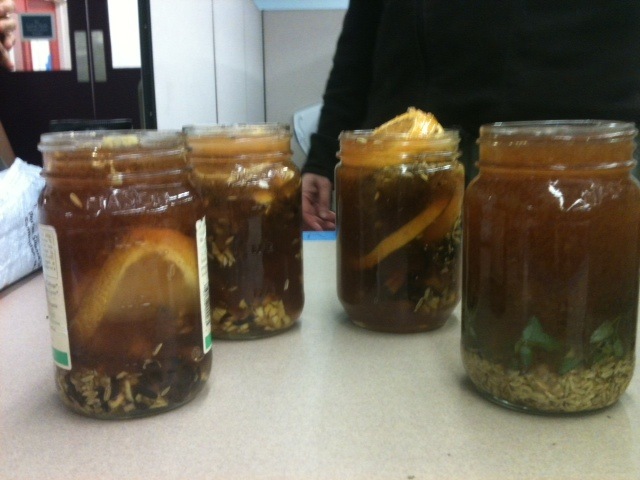 In January, we’ll make herbal salves, honeys, and syrups. In February, we’ll have an herbal spa day with footbaths and facials. You’ll get to take an herbal footbath home, as well as at least one product that we make. In June, we’ll see what’s springing up all around us. What we make will depend on the plants, of course, but a spring salad, nettle soup, and nettle vinegar all seem likely. In July, we’ll have even more to see on our plant walks, and we’ll probably make tinctures. We have a tradition of making and sharing delicious herbal beverages. We’ll keep our tradition of making delicious herbal beverages whenever we meet. If you’re not sure whether you want to do Wild Herb Week, come to a summer Wild Herb Day. If you register for Wild Herb Week at the end of the Wild Herb Day, you’ll get 5% off. How Much: $45 per family or household for each Wild Herb Day. This assumes that families and households make herbal products together and share them. For Gift Making day in November, you may make extra herbal dream pillows for an additional $9. per pillow. August 14-17, 10:00 a.m. to 3:00 p.m.
Wild herbs gathered in baskets we made at Wild Herb Week. One basket is still in process.